Strong Biotech Corporation considers “Research and Development” as an essential motor for progress and innovation of technology which are beneficial for human beings. With new technology in biomedical fields, we can expect better life quality by preventing certain diseases and decreasing suffering. Hence our R & D team devotes itself to commercialize our branded products, especially a whole range of research kits to support the scientific research and technical development. 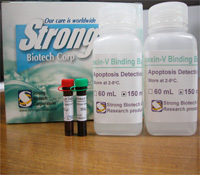 Strong’s branded products, a whole range of research kits, support the global scientific research and technical development. 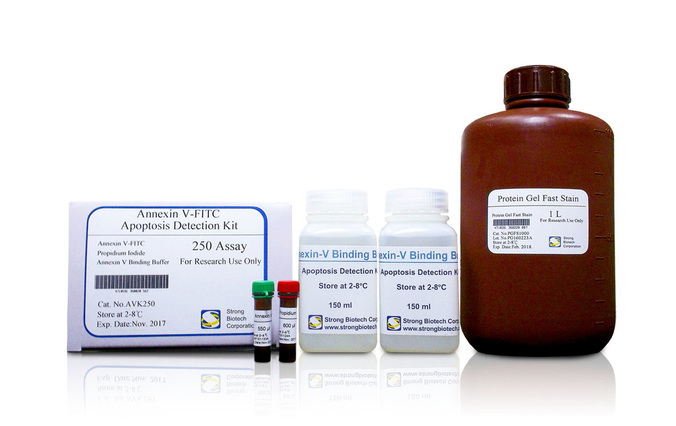 Applied in invention of new anti-tumor drugs to detect if the drug halts the abnormal proliferation or tumorgenesis process and induce tumor cell to undergo apoptosis cycle. 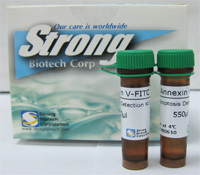 Allows for fluorescent detection of annexin V bound to apoptotic cells and quantitative determination by flow cytometry. microscopy Excitation wavelength in the range of 450-500 nm (e.g. 488 nm) and detection in the range of 515-565 nm (green). ​Analyze on a flow cytometer using 488 nm excitation and a 515 nm band pass filter for fluoresce in detection and a filter >600 nm for PI detection. Excitation wavelength in the range of 450-500 nm (e.g. 488 nm) and detection in the range of 515-565 nm (green). Analyze on a flow cytometer using 488 nm excitation and a 515 nm band pass filter for fluoresce in detection and a filter >600 nm for PI detection. 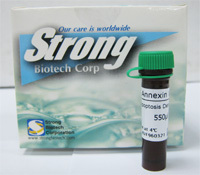 AnnexinV binds phospholipids in the presence of calcium. At the onset of apoptosis, phosphatidylserine becomes translocated to the external portion of the membrane. Since the movement of phosphatidylserine is an early indicator of apoptosis. 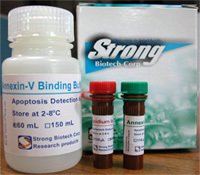 Annexin V conjugates can be used to detect apoptotic cells significantly earlier than DNA-based assays. 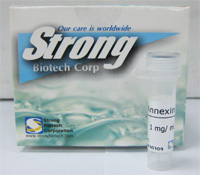 Proteomics is the core technology of Strong Biotech Corporation. It is widely applied in medical industry, life science, and cosmetics fields and support the research and development of biotechnology. Based on the Bradford method , it’s a simple colorimetric assay for measuring concentration of solubilized protein. 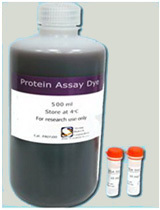 The kit depends on an acidic dye, binding with protein measured at 595nm by a spectrophotometer or microplate reader. Comparison to a standard curve provides estimation of unknown protein concentration. Based on the Bradford method , it’s a simple colorimetric assay for measuring concentration of soluble protein. 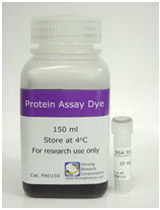 The kit depends on an acidic dye, binding with protein measured at 595nm by a spectrophotometer or microplate reader. Comparison to a standard curve provides estimation of unknown protein concentration. 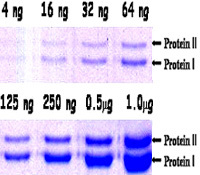 A fast and sensitive method for SDS-PAGE gel staining without organic solvent destain. The staining procedure is quite straightforward. It takes 30 minutes to visualize as little as 4 ng of protein amount on a water-clear background. Visualization of protein bands in electrophoresis gel. Destaining is not necessary unless a crystal-clear background required. If necessary, destain gel by water and it’s mass spectrometry compatible. To accelerate speed, a simple microwave procedure can be completed in 15 minutes.